Stay and Play at Maggie Valley Club & Resort. We have luxurious, spacious onsite accommodations which offer the ultimate in deluxe comfort - certain to make your stay a comfortable one. Adorned with designer furnishings and featuring a fully equipped kitchen, a dining room and an inviting living room with gas fireplaces, a sleeper sofa and cable television, our 2- or 3-bedroom, 2-bath condos offer private balconies and golf course views. Our Maggie Valley Lodging Suites are complete with a king-size bed in the master bedroom and a queen-size bed or two twin beds in the second and third bedrooms. 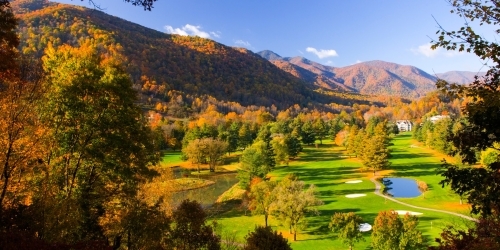 The course at Maggie Valley Club highlights the most spectacular scenery out of all the Western North Carolina Golf Resorts. It offers a unique challenge for beginners and even the most seasoned players. This established, 6500-yard course is surrounded by centennial trees and includes 30 acres of fairways leading to large bent grass greens. The front Valley Nine allows players to warm up before tackling the significantly more challenging Mountain Nine, which features an elevation rise of 800 feet and panoramas of the valley and beyond. Maggie Valley Club & Resort reserves the right to change price and offer at anytime. Prices and offer are subject to change without notice. NCGolf.com is not responsible for errors posted in this golf package.